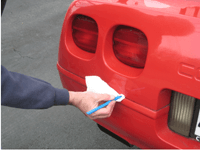 Order Today and See How Many Uses You Can Find for this Handy Scraper! The Scrigit Scraper is great for many uses that other scrapers can't handle. Learn More about what scraper to use. Very impressed with your product. Works flawlessly. I am shocked that something that seems so simple is so handy. I use it all the time to get off stickers, spots of paint left by the painters, and goop on my countertops. No more ruining my nails. This would make a great stocking stuffer. I can see it getting dull after a while, but for the price it's great. Most useful little tool... find new uses every day. I have super thin fingernails so this comes in handy all the time. I'm ordering extras so I can keep one in car, purse, kitchen, toolbox, etc. and give to friends to try. I purchased these for my mom. She already bought a few packs and loves them! She wanted to be able to gift them to people. Great invention! I really like your Scrigit Scrapers. I often have a hard time getting labels off boxes before recycling them; the Scrigit works great to get the label partly up so I can grab it and get it off. I also use it to scrape the buildup off my small electric grill which I use to make grilled cheese sandwiches. Even though I wipe it well after each use because it can't be submerged in water, buildup from cooking them is hard to get off. I use the Scrigit to carefully and safely scrape off this buildup (and saving my nails!) without scratching the coated surfaces. You invented a great product at a great price! Thanks! Great Little Gadget: Great little cleaning tool, especially for those hard to remove labels. The rounded edge is thinner and slides more easily underneath the label. Also found it useful for cleaning the cracks and crevices in the bathroom and kitchen. Only five stars though.....would have given more if they had let me. Best Cleaning Tool - EVER! This is the greatest cleaning tool invented! I love it! I had tried every tip to get rid of the hard water build-up around my sinks, and this little gizmo gets rid of it in a breeze. Everyone should have one. So simple and so brilliant. Everyone will get one in their Christmas stocking. I received the Scrigit Scraper - It's AMAZING! I used it the same day to remove paint from the floor in my kids' room and to remove stickers from their bed. It worked great. I think everyone need to have a Scrigit! I have a Scrigit and continue to find more uses for it. As it advertises, it works great scraping labels off (especially if I soak it first or use Goo Gone), but it is also great to remove dried food on surfaces (who doesn't drip the batter onto the counter when making pancakes?). I use it when I'm cleaning. It is just the right size to fit in the small crevices - for example around the base of my kitchen faucet or where any two surfaces meet. Any time you might grab a fork or a knife to use as a tool, the Scrigit is so much better because you don't bend your fork tines nor do you scratch the surface you are cleaning like the metal does. The only problem I had when I first got it was remembering I had it (kinda like reusable grocery bags) so when you get yours keep it in an easy to find place. With the holidays coming up, they would make great stocking stuffers and only cost a few dollars each. Did I discover a new use for my Scrigit Scraper? Rather than using a sharp knife to open all those holiday shipped boxes, I found the Scrigit Scraper is a great tool to pry under the seals, defeat the glue, and open the box ... all with little damage to the box itself. The Scrigit Scraper neatly works between the cardboard layers to separate the glue. Plus, I can re-use the box! 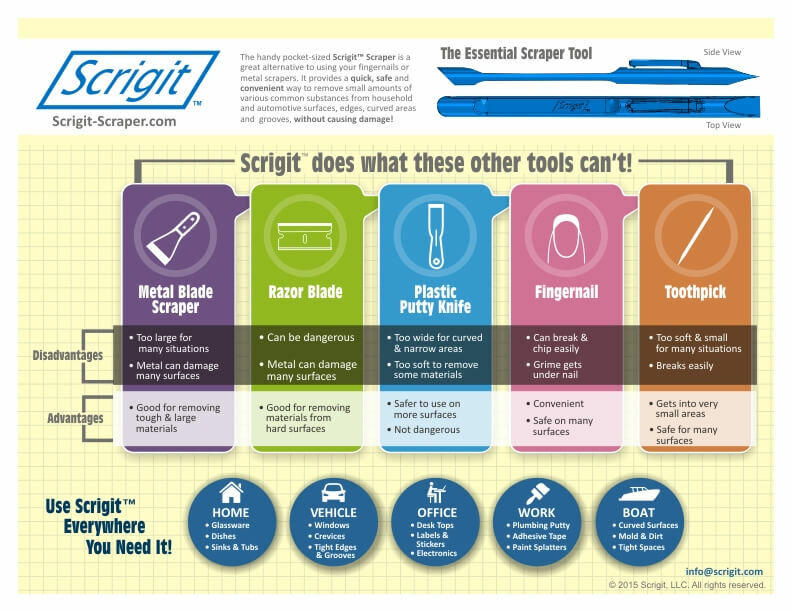 The Scrigit Scraper is the tool you never knew you needed that you now can't live without. I love mine! This little tool is so useful. Every time I start to use my fingernails as a tool, I remember my Scrigit and use it instead. It saves my fingernails and does a good job. Worthwhile purchase. I just received my Scrigit Scrapers that I won on a blog and I am already in love with them!! After reading the back and seeing everything I can do with them I am ready to scrigit away. These have to be the best thing ever invented and I can finally give my nails a "break"! I purchased the package of Scrigit Scrapers through Amazon. We have received them. They are being used to scrape off glue from construction in our new building wings. We cannot use metal or very sharp objects. They are working well, and we will be exploring more uses in the future. The staff likes them and I plan on ordering more in the future. Scrigit works wonders on labels that don't come off easily. I soaked my jar labels and removed the remaining glue and paper residue with Scrigit. It came off like magic! Then I used Scrigit to remove spilled honey on my glass shelves in the refrigerator. Came off, no problem! Very handy in the kitchen and washes off easily. I have been using the Scrigit for four months on a wide variety of surfaces. I used it this week to scrape some residual caulking off our new kitchen backsplash. It worked very well without scratching the tile! I keep my fingernails cut quite short, so the Scrigit is very useful for me. I have used it a LOT in the kitchen -- the plastic tool doesn't harm cooking surfaces, and it's a must-have for anyone who ever cooks pizza or anything else with cheese! I also keep one in my truck, one in my black powder range box, and one in my purse. I have scraped off stubborn price tags, gotten into shrink-wrapped CDs, spread glue into a tight corner, and used them for numerous other tasks. Got the Scrigit the other day and have used it several times with great results. I have used it to clean kitchen counters and the stove to remove stuck on food splatters. I have always hated when I buy something at the store and there is a price tag stuck on it that won't come off cleanly. The Scrigit works great at removing those price tags without damage to the product. I will be buying another pack to keep in different places around the house. 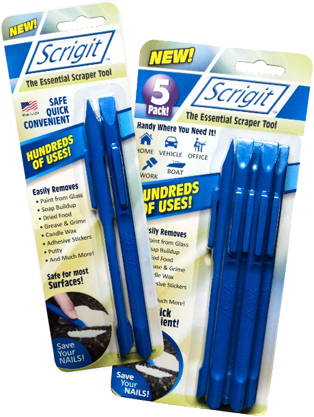 The small size of the Scrigit Scraper makes it easy to keep them in handy locations around the house so I can quickly grab one when I am cleaning or need to remove an adhesive label. The Scrigit Scraper is great for cleaning off small spots of dried food stuck on my granite countertop and brown grime that builds up along the back edges and corners by the backsplash. It is really handy to keep by the kitchen sink so I can quickly remove bits of food stuck to dishes, pots and pans.